It is true that State College carries the traditional “college town” label, with plenty of activity to offer the thousands of students that come and go through Penn State each year. But for young professionals coming from elsewhere in the country who find themselves in the area either for school or for their careers, settling in and discovering what Happy Valley has to offer them looks a little bit different than it does to an incoming freshman. Seeing the need to bring together resources, networks, and activities for those in their 20s and 30s in the area, local professionals have come together to create awareness and a niche for this demographic. The State College Young Professionals (SCYP) is an organization dedicated to enhancing the community by providing an opportunity for professionals to network, volunteer, socialize, and have fun. The group has grown from 15 to 35 members in 2009 to about 200 today, and it has a 13-member board of directors, with several committees overseeing outreach, social events, sports and recreation, and new-member engagement. In a town where many young professionals come and go based on where their next jobs take them, SCYP recognizes the need for a group such as theirs. In addition to monthly happy hours, the group is involved in a variety of outreach initiatives, including fundraisers such as the YMCA’s Polar Plunge and volunteer opportunities through the RSVP Pen Pal program, Centre County Youth Service Bureau, Special Olympics, and Toys for Tots. In 2014, the group’s volunteering hours exceeded 650 hours. For Hombosky, who co-owns 3twenty9 Design, a multimedia and Web-development company with her husband, Troy Weston, as well as friend, Nick Stanko being part of an organization such as SCYP also has helped with business. Because of the connection to local businesses in which the firm serves, she has seen her business only grow. “We were going to move away, but our business keeps growing so much that it doesn’t make sense to go start over somewhere else since we’ve established so many contacts through living here so long and from groups like SCYP,” she says. For Emily Bartlett, who is the marketing and public relations director for SCYP, the group provided a social outlet outside of work for her and her husband, Paul Robertson, who had moved to State College from Austin, Texas. Both of them are now employed by Penn State. “I Googled ‘State College Young Professionals’ because when we moved here it wasn’t easy to get to know people necessarily through work,” says Bartlett. She explains that the transition to State College was interesting because in a place such as Austin it is so easy to meet people. However, she didn’t find the same sense of community and responsibility that she has experienced since moving to this area. Involvement, she explains, also helped her to find out what there is to do in the area. For Serena Fulton, a recent Penn State graduate and membership director at New Leaf Initiative in downtown State College, going from student to young professional required a little bit of legwork in order to find her niche in the community. A large part of the reason why Fulton, originally from the Wilkes-Barre/Scranton area, decided to stay in State College following graduation in May 2013 was due to her involvement in New Leaf Initiative, a nonprofit founded in 2010. New Leaf serves as a hub for community constituents such as entrepreneurs, community organizers, businesses, students, local government, and more to work together. Not only does New Leaf offer a physical space for paid members and the public to utilize, but also forums and events designed for members to share ideas and collaborate. Fulton became involved in New Leaf as an intern during her junior year at Penn State. A year earlier, founders and Penn State alumni Steve “Spud” Marshall and Eric Sauder had started the nonprofit with the intent of creating a platform where multiple sectors of the community can connect. Fulton continued on as an intern with New Leaf through her senior year, energized by the culture and growth of the organization. She says that the organization is focused on the concept of coworking, in which independent freelancers and small startups that are currently working out of home offices share the same space but conduct their own independent activity. 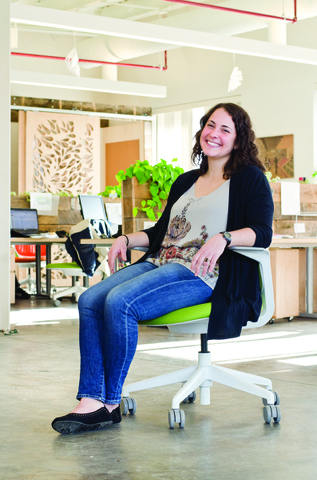 “It’s ideal for those who want a professional office space but don’t want to worry about the overhead,” she says. Being a relatively new concept to the area, New Leaf is educating the community about coworking and creating awareness. The initiative also is what prompted the organization’s relocation last year to its new office space in the borough building in downtown State College. With private and shared workspaces, meeting rooms, and kitchen area, the new space provides all the amenities of a professional office with an airy, modern look and feel. Groups who utilize the space come from all sectors within the community. New Leaf hosts various student groups from Penn State each semester, as well as local entrepreneurs, independent contractors, companies such as CATA, and also borough staff. Although the space is used by community members of all ages, Fulton says that the retention of young professionals is definitely a topic of discussion among the group. Personally, she sees a lot of benefits to living in the area — the convenience of living downtown and biking to work, being able to go trail running in local state forests, exploring local communities such as Millheim, and playing in a pickup soccer league. She says that being exposed to different activities beyond the college scene would go a long way in retaining young professionals. Serving as somewhat of a think tank for issues surrounding the young-professional demographic in Centre County, the Gateway Group is the young-professional arm of the Chamber of Business and Industry in Centre County (CBICC). As part of CBICC’s mission to bolster the private-sector industry and retain young professionals, the Gateway Group looks to establish connections among young professionals, community members, and organizations within the area. Harman, who now works as administrative support assistant for the Lunar Lions in the Applied Research Laboratory at Penn State, came to State College in 2011 after her husband had been accepted to graduate school at the university. She left behind a job of three years in New Jersey and started working part-time in State College until she found full-time employment through the chamber. It started to become apparent that a forum for discussion around topics of importance to young professionals was needed. James Bradley, also part of the initial Gateway Group meetings, says that one of the focuses of the group is to figure out how State College could be a beautiful, interesting, and compelling place to live. place that allows him to strike a good work- life balance. In the upcoming year, the Gateway Group is looking to develop initiatives with groups such as New Leaf Initiative to put together mentoring programs for young professionals. The group also will continue working with Penn State to attend events such as the job fair during the first week of classes, with the goal of introducing students to the different employers and career possibilities in the region. The group also looks to tackle issues such as creating more affordable housing in the area for local young professionals who are just starting out in their careers. According to Todd Erdley, president and CEO of Videon and creator of the Centre Region Entrepreneur Network (CREN), encouraging an entrepreneurial spirit is key to driving the kind of economic development that will attract and retain young professionals. establish themselves in this area is important to the vibrancy of the town. She coordinates Global Entrepreneurship Week, which is an international event that takes place each year during November. Last year’s event brought together more than a dozen Penn State student organizations, 18 academic colleges and programs, and 13 Centre Region partners to more than 60 events designed to inspire people to explore business opportunities and innovation. Through her efforts, Feltman says that the SBDC is slowly but surely getting the word out that Happy Valley is a place where students can settle and not just go to school. Continued support for all of these resources, networks, and endeavors is where community and social responsibility step in. Many agree that without being supportive and aware of one another’s efforts, it will be difficult to create the culture and environment that makes young professionals and business owners want to get their start or stay in the area. Lori Wilson is a freelance writer living in State College.